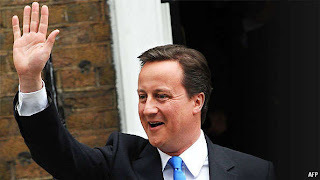 David Cameron, leader of the UK’s center-right Tory Party, today became the new Prime Minister of Great Britain. The good news: He understands the severity of Iran’s nuclear threat; has likened Islamic extremism to Nazism; supported the war in Iraq and opposed calls to cut and run; supported the war in Afghanistan and resisted calls to cut the number of British troops there; refuses to unilaterally surrender the UK’s nuclear deterrence; he’s part Jewish; he has publicly declared himself a Zionist; and he has taken pro-Israel positions in the past, including Israel’s right to defend herself in the war against Hamas in 2009. The not-so-good news: Cameron supports a two-state solution between the Israelis and Palestinians, which by definition requires dividing Israel and carving up pieces of Jerusalem; he has described East Jerusalem as “occupied” territory; he has been sharply critical of Israeli settlements; he leads a weak political party, holding only 306 seats, well short of a majority, and is thus dependent on left-of-center political parties; and to gain power, Cameron built a political coalition with Liberal Democrat leader Nick Clegg who has been so severely hostile to Israel that he actually called for an arms embargo against the Jewish State. Will David Cameron be a friend to Israel as the rest of the world — and nearly all of Europe, and now the White House – isolates Israel? I pray the answer is yes, but it remains to be seen. Given the coalition he has just built, I must say I’m concerned.